Inside Florida's renowned Hard Knocks 365 gym, the ONE Light Heavyweight and Middleweight World Champion is deep in camp preparing for his upcoming middleweight title defense against Japan’s Ken Hasegawa. The pair’s first clashed was last June at ONE: SPIRIT OF A WARRIOR, in what is considered the greatest World Title bout in ONE Championship history. “The Burmese Python” emerged victorious from the bruising encounter, stopping Hasegawa in the fifth. However, the back and forth nature of the contest meant a rematch was inevitable. “My take away from the last bout is not to let Hasegawa settle and get his timing. Pressure him early and stay on top of him the whole bout,” Aung La said taking a break from training. When the cage doors shut on 31 March, Hasegawa will find himself facing off against not only a technically sharper version of Aung La but one who is also more physically imposing. “For this camp, I am starting the camp with 10 pounds more of muscle,” Aung La said. Aung La speaks highly of the environment fostered by the coaching staff at Hard Knocks 365 and feels since making the move to the South Florida gym he has grown as an athlete. “The atmosphere and the trainers are what attracts a lot of talent. The trainers have been there and done it, and so it's easier for them to relate to the fighters. Henri Hooft, Greg Jone, Kami Barzini and Doctor Corey Peacock are amazing trainers who are amazing at each individual art and have the respect for each other and work together very well,” the two-division World Champion added. Training alongside him is compatriot and fellow ONE athlete Tial Thang, who will be making his promotional debut at ONE: REIGN OF VALOR. When asked if he envisions a new generation of Myanmar athletes following in his footsteps, Aung La is optimistic about the future of the sport in his homeland. “For sure, the interest is there, and the young generation are starting to love and learn about mixed martial arts,” said Aung La. Having a trailblazer like Aung La certainly helps when it comes to inspiring Myanmar’s future World Champions, and the 33-year-old is looking forward to fulfilling a lifelong ambition at ONE: A NEW ERA . 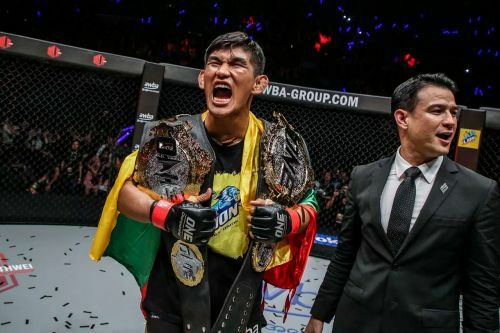 “I dream of fighting in Japan and to be able to fight in such as stack card is a dream come true and I plan on stealing the show,” Aung La concluded.